Don't you just love this photo of my house? Mark took it last night so we'd have a photo of it all lit up for the season. We are pretty low key with our decorations - believe me, our neighbors take care of the carnival, kwim? So anyway, this was taken about a half-hour before the snow started falling gently in our area. THIS is my house this morning at about 10: 30 am. I think I woke up on a different planet! Our local news is asking for people to send in names for this storm - which happens to be the worst since 2003! Some of the names are the "Shopper Stopper Storm", "Snowtorious S.N.O. 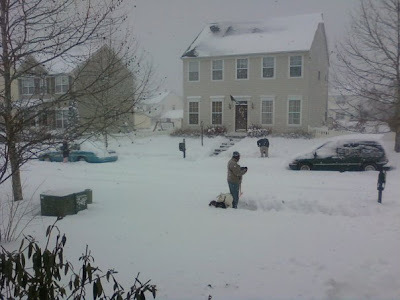 ", "Snow-pocalypse", but my fave is my post title today "Snow-nami 2009"! You know it's a bad storm when the weatherman calls it "crippling". And we've just been 'upgraded' to a Blizzard. Hmmm.....think I'll be in my jammies for a while today! Here is a pic of my deck looking out across the alley. But, it's snowing so fast and hard that there is another inch and a half built up in just the hour since this picture was taken! It sure LOOKS pretty in this picture looking out towards my other neighbors yard. But Mark says this shoveling business is for the birds! Of course, Emma can't wait to get out in it - her boots just aren't cooperating! Susie, our snow-lovin' dog is whining because she can't get out the front door to be with Mark. Look at the snow up against our front door. Our stoop is 6" high, and there is another 6" drift up against the door. I think I like his attitude! Just bring on the hot chocolate! I hope you are enjoying your Saturday wherever you are and whatever the weather is! I'll post more pics later! Oh my goodness Robin, thanks for letting me know what I'm in for. (I think lol!!) I'm planning pajama day for tomorrow too, while the kids decorate sugar cookies. I love the idea of the before and after pic, I just might have to do that! Your house looks beautiful all lit up for the holidays! Yowser that's a lot of snow. Can't say I'd want to be there (I hate snow) but those were great photo's. Stay warm for sure my stamping friend. It's raining here today. Oh, I love the pictures Robin; they are beautiful! We, also, got snow yesterday and during the night, here in Greensboro, NC. Love it! TFS pictures of the snow. Love snow scenes. Love your pictures of the snow thanks for sharing with us.....I think we will remain snow-free at least for the short-term here in oklahoma city so love to see others pictures. Your pups are so cute. Susie is just tense with excitment you can see it all over her body language and little Buster is quite the opposite! LOL Thanks for sharing those. Jenny from Green Bay, WI. So jealous that Ohio is not getting the record amounts of snow. I just love blizzards! I hope that we will get it next. Our two inches this morning is no where near a good snow, but I do have a cute little snowman in my front yard! Hoping for more snow this week... Enjoy the Virginia snow! WOW!!! Love the pictures of your house and allllllll that snow!!!!! We were suppose to get around an inch today but no luck for us!!! It all went north of us and I suppose you guys got the blunt of it!! Make sure you all stay safe and wark!!! I am sure you will get tons of awesome creations done while you are snowed in!!! You guys need a snowblower! We blew it out of the way and are waiting for the next round.. Just the beginning here! Glad you're coming to visit! :) Hugs! Great photos Robin! And just in time for Christmas. We don't get anything like that here in CA!! !